Superb duplex on the 5th floor with 4 bedrooms. The property also includes 2 bathrooms situated within. 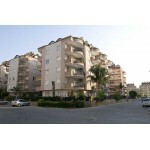 The property is situated in Alanya Turkey. The property also includes a superb communal pool which provides a nice area to cool down on hot sunny days. Along with the pool there is also a communal garden which provides a wonderful area to relax. Alanya has a typical hot-summer Mediterranean climate. leaving the summers long, hot, and dry, prompting the Alanya board of Tourism to use the slogan "where the sun smiles". A superb opportunity for those interested in owning property in this superb area within Alanya Turkey. in the country's Mediterranean Region, 138 kilometres east of the city of Antalya. while the district that includes the city and its built-up region had an area of 1,598.51 km² and 248,286 inhabitants.